Whatever your feelings are about them, if you have a child in a First Communion program you will probably have to glue something together in order complete the program. It's true that these banners don't really add much to the sacred atmosphere of the Church and often time (I dare say) appear a little tacky. But the fact remains that working on a project like this with your son and daughter can be a useful tool for explaining the symbols of the Eucharist. 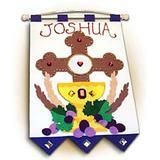 If you'd like to make your First Holy Communion banner project as painless as possible, we have some First Communion Banner Kits that will help you immensely. The pieces are pre-cut so you don't have do do any cutting or sewing. Your child will enjoy the time with you, you can reinforce your child's understanding of the Eucharist, and you'll finish up in no time. 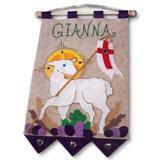 Why should you get one of our First Communion Banner kits? Avoid the Hassle – Each kit includes all of the kit parts and instructions to assemble the kit..
No cutting or patterns involved! Family Owned – The family company that produces these kits is located in the United States and the whole family is involved in cutting and packing the kits. 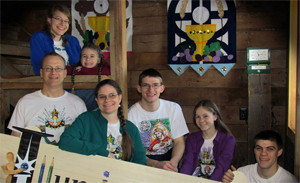 Variety – With a dozen styles that can be assembled in multiple ways, your child is sure to have a unique display for your parish. Economical – When you add up the time and gas involved in making or finding patterns, buying materials and cutting out all the pieces, buying one of our kits is going to save you both time and money and leave you with a high-quality banner.Browse our selection and save yourself some hassle today.